A good scope is key to building an accurate and reliable rifle. Like a house, however, a scope is only as robust as the foundation upon which it is built. It is worth investing in the best scope rings. As usual, with thousands of choices out there, we have you covered. The rifle and scope choices you make will determine what the best scope mounting option is for you. Scope rings usually attach to a scope base which is itself attached to the rifle. Some rifles are drilled and tapped to mount the manufacturer's proprietary rings without the need for a base. Different scopes require different bases. Most scope bases consist of lengths of mounting rail. There is no standard, but the most common types of rail are Picatinny, Universal, Weaver, and Dovetail. Both scope bases and rings are made at different heights. Although you generally want your scope to be as low to the bore as possible, large objective lenses necessitate raising the scope height enough to clear the barrel. 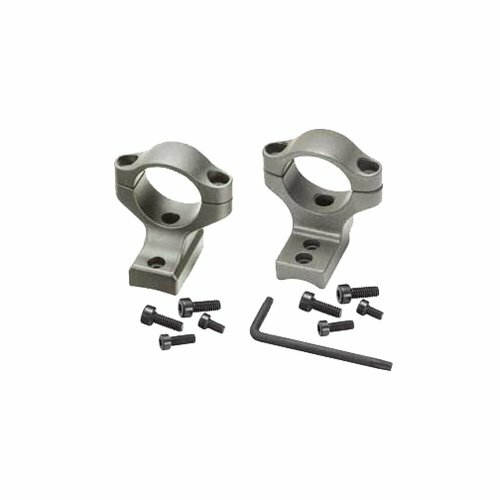 Sometimes scope rings and scope bases are incorporated into a single unit, called a scope mount. Before you choose scope rings, you must have already chosen which rifle and scope combination you will use. Most scope tubes are one inch in diameter, but some are 30mm or rarely, 34mm. These latter tube diameters provide a greater range of elevation adjustment for long-range shooting. You can only use scopes and rings that are of the same diameter. Doing otherwise can cause irreparable damage to your scope or, at a minimum, simply will not work. Some rifles, like AR-15s, come with integrated scope bases, usually in the form of a rail. Others have propriety mount points. Either way, you must confirm that they are designed to mount to the base or to one of the base options, at hand. Also note that some scopes are shorter than average, potentially preventing them from being mounted on rifles with standard mount spacing. Your product must be high enough for your scope's objective lens to clear the barrel. 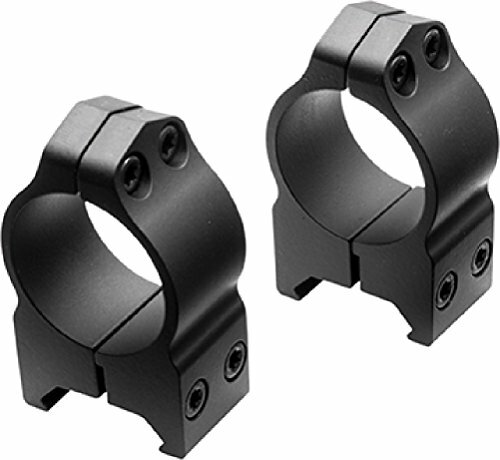 Some scope rings are designed to allow you to switch to iron sights for short-range shots. This will also add height. Otherwise, the most important thing in scope rings is reliability. Whether you choose steel or aluminum, look for a reputable manufacturer, a proven design, and a good warranty. There is a bewilderingly wide selection of scope rings available. Having determined the specifications you need, simply browse our list and you will find the best scope rings for your rifle and scope combination. Although it is a relatively new company, Wisconsin-based Vortex has built a great reputation for itself. Vortex definitely punches above its weight in value for money. 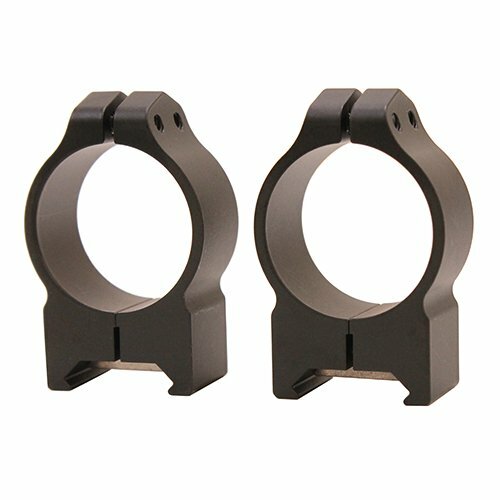 These are designed to marry a 30mm diameter scope to any rifle with Picatinny rail. However, they are optimized for AR-15-style tactical rifles. Vortex gives you a selection of five ring heights, including options to have your scope be in absolute co-witness or lower-third co-witness with standard AR-15 iron sights. In the former case, your iron sights and scope will line up exactly and in the latter case, the point of aim of your iron sights will be slightly lower than that of your scope. The robust aluminum construction of these sights includes a cut-away on the higher models to keep weight to the absolute minimum. The horizontal-split design makes mounting a scope slightly easier, while the six bolts provide maximum security. The build quality is backed up by Vortex's market-leading transferable unlimited lifetime warranty. A tool for attaching them is included. 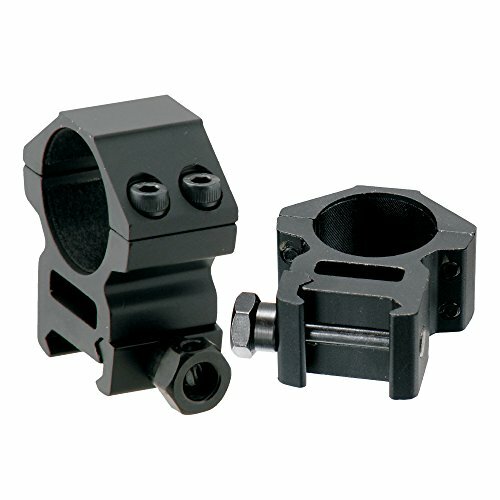 If you need scope rings to attach a 30mm scope to a Picatinny rail, Vortex has you covered with this tactical model, no matter what height you need. The top feature of this product, as with any Vortex product, is the unbeatable warranty. In the world of scope rings, Warne is pretty hard to beat for sheer quality. This is a set of 30mm rings that attach to nearly any rail, Weaver-style, Picatinny-style or Warne's own proprietary scope bases. These have a few unique features to help ensure reliability, particularly in the face of heavy recoil. First, the width is greater than average at .705" to offer greater surface area and grip on the scope. Each ring includes a stainless steel recoil control key to provide solid contact along the entire surface of the rail groove. This prevents slippage and greatly increases the recoil resistance. The vertically-split design offers many advantages. The bottom bolts, which secure the rings to the base, also automatically align the rings, reducing the need to lap them. Unlike horizontally split versions, there is only one gap between ring sections, offering a more complete, hose-clamp style grip on the scope. Vertically-split rings also allow for an unobstructed view of the parallax knob and windage adjustment. 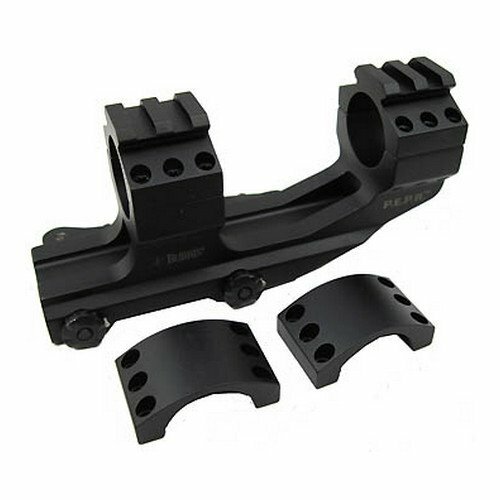 This product comes in three heights to suit your rifle-scope combination and are made of steel. 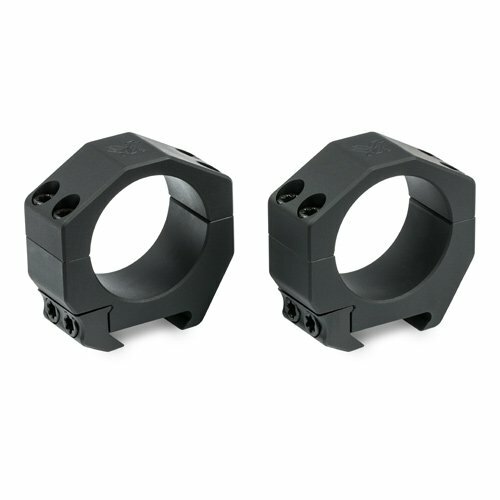 These rings are designed and built to offer excellent reliability no matter how heavy the recoil they are subjected to. Although they can be tricky to mount, once on there they perform with flying colors. The vertically split design, recoil key, and steel construction are great benefits. This is a no-nonsense set of one-inch rings which mount on either a Picatinny-style or a Weaver-style rail. These horizontally-split rings are constructed of machined aircraft-grade aluminum. They come in three height positions with a cut-out section below under the scope to potentially allow you to use iron sights at short ranges. Four hex-bolts secure the scope to the ring. One large bolt holds each ring to the rail. The pair ships with an Allen key and one extra bolt, just in case. The Allen key is important because the bolts are in metric units, so few of us will have the right tools in our toolbox. The value for money is unsurpassed, especially since they allow you to continue using your iron sights. They are covered by a limited lifetime warranty against defects. These UTG AccuShot rings offer outstanding value for money. The biggest selling point is the cut-out design allowing the use of iron sights. The warranty also helps make this an anxiety-free purchase. However, the rounded lug and metric dimensions may turn some shooters off. Given the price, these are minor concerns. 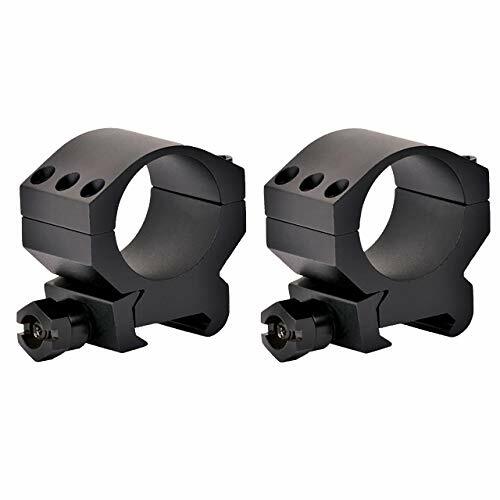 These are an excellent option if you have a specialized, long-range 34mm scope. They come in five height options to ensure you get the ideal clearance over your bore. They have a sleek, modern design and are designed to mount on any Picatinny rail. Vortex has employed a unique manufacturing process for these rings. They ship in pairs which have been manufactured together from the beginning, ensuring perfect alignment. This prevents the need for lapping and prevents damage to your scope. They have been CNC machined from billets of high-grade aluminum. The two rail-mounting bolts and four scope-mounting bolts on each ring are of the same hex design. A hex wrench is included. These rings are made in the U.S.A. and are covered by Vortex's outstanding unlimited lifetime warranty. Given their impeccable design and reliability, it is little surprise that these rings enjoy an outstanding level of user satisfaction. Vortex punches above its weight in value and reliability. The top features of this set are the precision-paired manufacturing process and the unlimited lifetime warranty. The choice of five height options is also great. The standardized bolt sizes save you from fumbling for more than one tool when trying to mount a scope. Just ensure that you have a Picatinny rail and you can't go wrong with this product. Weaver is a legendary name in the optics world. These rings feature a classic tactical design and offer outstanding value for money. Weaver covers all the bases, giving you three height options for one-inch scopes and four options for 30mm scopes. While the value for money is very good, these are not a bargain basement option. The design features have been carefully thought out. Weaver has not wasted resources on over-designing these rings. They feature a solid six-bolt design, with strips along the top between the bolts, skeletonized for weight reduction. The overall aluminum construction also helps keep the weight down. They attach to a Weaver or universal rail with a standard single large bolt. The construction is covered against defects by a limited lifetime warranty. One word of warning, it can be difficult to select the correct height for your rifle and scope combination. Careful measurements and trial and error may be necessary. Weaver is a name that inspires confidence. These no-frills rings are a solid, aluminum-built option. The top features are the lightweight, skeletonized construction with a robust six-bolt design. This is a great, solid offering for the price which is covered by a decent, basic warranty. Be prepared to lap these rings to avoid damaging your scope. Few names in the optics business are as reputable as Nikon and do not disappoint. All the little details are there to provide the best in reliability and performance. First, they feature an all-steel construction. They are also vertically-split. This gives superior alignment, reducing the need to lap them and providing a better, hose-clamp style grip. There is a rectangular steel recoil key that fits snugly in the rail groove to resist shock. The four bolts are all the same, reducing the number of tools needed for mounting. They are designed to mount on practically any rail, whether Weaver-style, Picatinny-style, or Warne-style. They are nicely sculpted and beveled, giving a smooth look that exudes quality. They come in three height options. Nikon suggests that the medium height is best for scopes with a 42-52mm objective lens, while short and high are best for anything less or more than that, respectively. Nikon has thought out every detail of these scope rings and offered a very well-developed product. The best features are the vertically-split design and anti-recoil features. The near-universal compatibility with mounting rails is also a major plus. Although vertically-split rings are less easy to mount, you will thank yourself for the better alignment and grip. If you have a Remington 700, particularly one in stainless steel, these proprietary Remington rings are a natural match. They also fit standard one-inch scopes. As Remington 700 rifles are already drilled and tapped, you do not require any other base, rail, or mounting solution. This gives you much greater stability and reliability; there are far fewer parts that can come loose or fail. This product is constructed of a proprietary, steel-based Z2 alloy which is marketed as being fifty percent stronger than aluminum. The bolts are also highly rated for strength. They are machined in the U.S.A. and are covered by a lifetime warranty against factory defects. The medium height rings are great for scopes with 40mm optical lenses. The horizontally-split design offers easy mounting despite the reduced number of parts. The quality and benefits of using these proprietary scope rings are so great that I'd say there is no legitimate reason to use anything else on a Remington 700. This offering is a no-brainer solution for any Remington 700 rifle. The reliability and proprietary design are the major benefits. You can't beat proprietary rings from your rifle's manufacturer, especially if they are made in the U.S.A. These are Vortex's standard hunting rings. They are available in three heights both for scopes with one-inch or 30mm tubes. They are horizontally split, allowing easier mounting. This is especially so with their two-bolt design. The drawback of this easy mounting and assembly, however, is that Vortex does not recommend these for heavily recoiling magnum rifles. They mount to either Weaver or Picatinny-style rails with a standard large, tactile knob with a flathead slot. The high version features a cutaway under the ring, allowing you to use your iron sights, if available. They are made of high-end, aircraft-grade aluminum and come in packages of two. As with all Vortex products, one major benefit is that they are covered by Vortex's excellent unlimited lifetime "VIP" warranty. Note that Vortex's ring heights are one size up from the average; medium size is more like high and high size is more like extra-high. Most people come away completely satisfied with Vortex products. If not, you always have the fantastic warranty to fall back on, keeping your purchase anxiety-free. 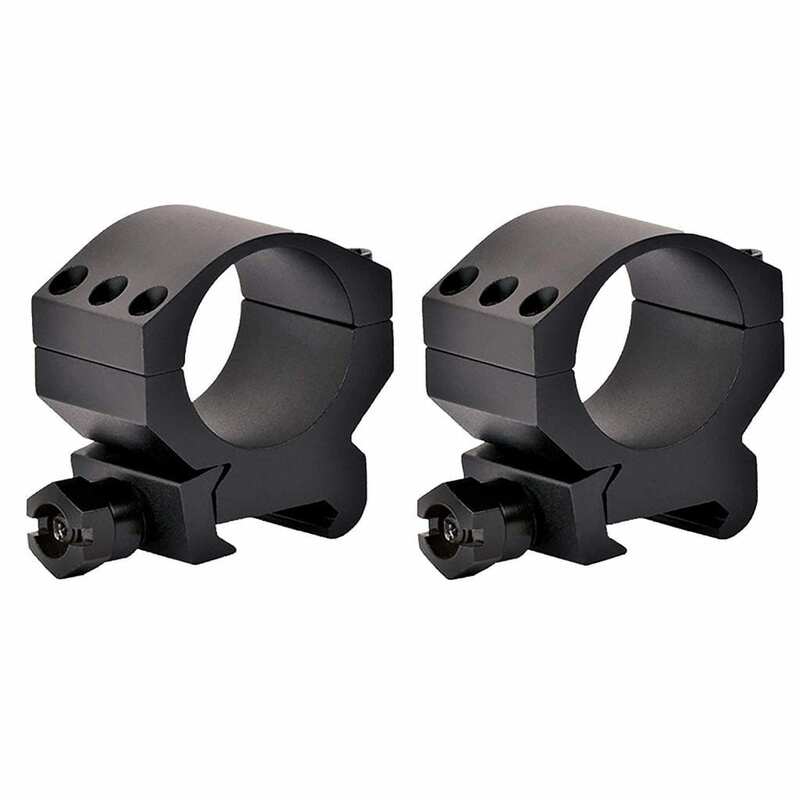 If you need rings for anything but a high-recoil magnum rifle, these are great value for money and are easy to mount. They are also very lightweight. For a .22 LR, for example, these are hard to beat. This is a quick-detach integrated set of rings and base from Burris. Colorado-based Burris is a huge name in the optics field which commands considerable respect. This arrangement may cost a bit more, but it solves quite a few problems for you, saving time and probably money in the end. First, as one unit, both rings are already perfectly aligned, negating any need to lap them. Your scope is held in place by six hex bolts on each ring. 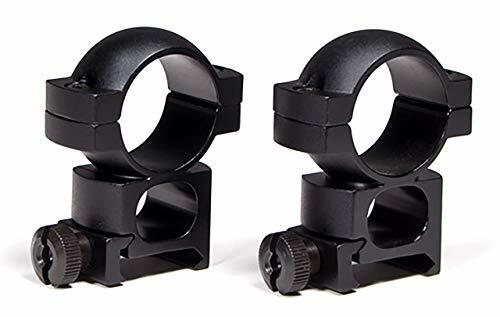 They are horizontally split to provide easy scope mounting. 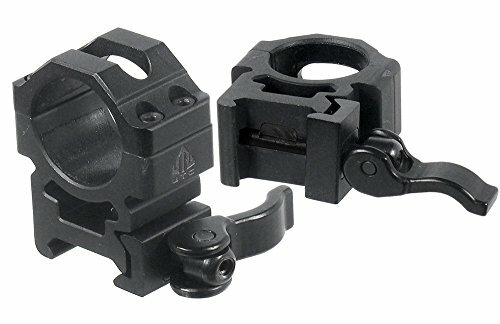 These attach to a standard Picatinny or universal rail on your AR using two quick detach levers. The build quality allows you to repeatedly detach and re-attach the mount without losing zero, no mean feat. The mount is also designed to allow an ideal eye relief and field of view. If you want a hassle-free scope mount for your AR-style rifle, this is a great option. The quick detach feature allows you to get the most out of that top rail. Alternatively, you can use this scope mount to sight in different rifles. Although this mount is imported, Burris’ design and quality control have come through with a very effective product. There are too many nice design details to mention, like the optional ring-top rails or the six-bolt scope clamps. You might even be able to view iron sights through the space under the rings. This is another set of rings that offer great value for money while covering all the bases. First, they are quick-detach, allowing you to get the most of the rail across the top of your AR-style rifle. They are constructed of a combination of steel and aluminum. Both the area below the ring and the top strap of the ring are skeletonized. This produces an exceptionally light pair of scope rings. They attach a scope with a one-inch tube to either a Picatinny or Weaver rail. The scope is secured to each ring with four bolts. The inner surface is coated in a high-quality synthetic protective surface. The levers are adjustable with an Allen key to ensure proper tension and the ability to re-zero. Even if you intend to use them on a rifle other than an AR, these are some of the best low-cost rings with the highest machining tolerances that you can find. They are guaranteed against factory defects. This product has a bit of everything at a great price. The top draws are the quick release design and the low weight. Whatever scope and rifle combination you are trying to marry, we have a top pick for you. Just make sure that your rings are the right size for your scope tube, that they will be high enough for your optical lens, and the spacing will work for your scope.